Let me wish all of you out there a very happy Durga Puja! My memories of Durga Puja, strangely, are quite recent. 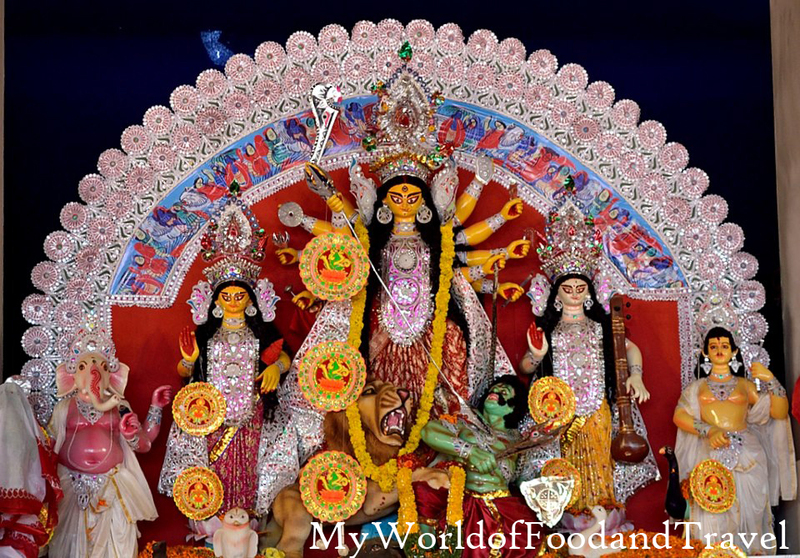 I was brought up in a tiger sanctuary where Kali Puja was more celebrated than Durga Puja. Even after we shifted to Guwahati, I could not attach myself to Durga Puja as fervently as our neighbours and my friends. Sis and I would grudgingly go to the local puja pandal to ask the Goddess’s blessings and then wait for the longest time for the ‘bhog’ to start. All the aunties I knew would be present in their finery and would look very busy, some distributing prasad, others flowers. Once or twice they would stop by and ask how our studies were going along. The microphones would be blasting with the panditji’s mantras and directions to his assistants, ‘now bring me this’, ‘throw away that’ and even the cursory ‘ki khobor (how are you)’ to an acquaintance in the middle of his chanting. And then the serpentine queue for the bhog. Undoubtedly, that calls for a lot of faith. I think I developed faith of this sort for Durga Puja when I started attending the pandals in Mumbai. My cousins were gung-ho about Durga Puja and would not miss even one pandal in Mumbai. And thus my Durga Puja adventures began. Or rather, my food memories of Durga Puja. Our closest jaunt would be the Lokhandwala Durga Puja, better known for its association with The Times of India and the singer Abhijeet. First thing we would do on entering the Puja premises was to salivate looking at the food stalls. And while bowing our heads to the Goddess, we would be pondering over which stalls we should visit and what we should order. What faith, really! This weekend, the husband, who is from a heavily Bengali-dominated region of Assam, got into the Puja fervor and bought a huge 2-kg katla fish. 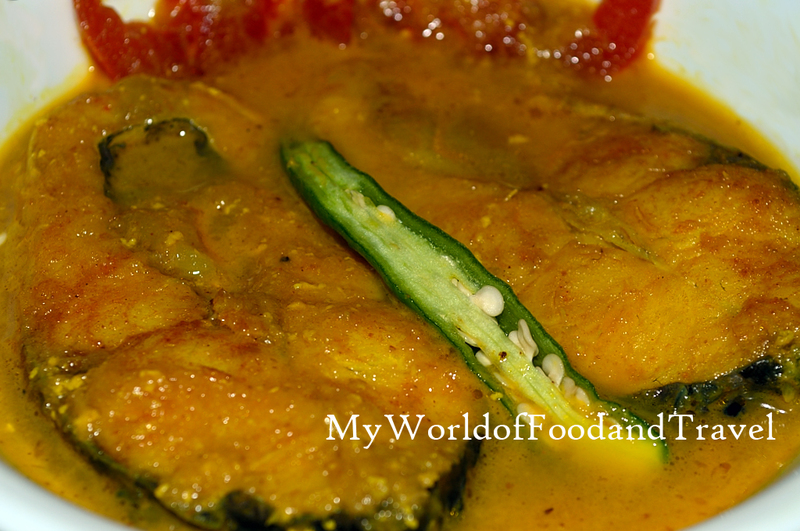 I decided to recreate one of my favourite Bengali fish dishes which we order whenever we are eating out at a Bengali joint. 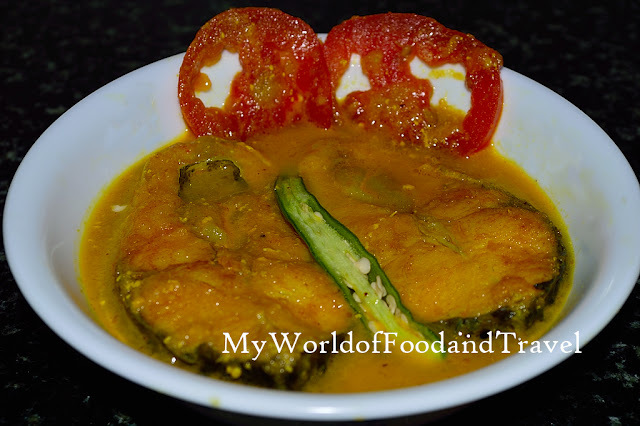 My version of fish kalia is not very spicy, given the family’s delicate palate, and like my other dishes, very fast and easy to cook. So, with a full-throated “Jai Durga Mai Ki” let’s get on with the recipe! Smear the fish steaks with a pinch of turmeric and salt and lightly fry them in mustard oil. Keep them aside. Grind into a paste the onions, ginger-garlic, green chillies and raisins. Now, heat a kadai and pop in the dry spices – cardamom, cinnamon, bay leaves and cloves, in some mustard oil. When the oil is infused with the aroma from the dry spices, add the ground paste and fry the mixture till the raw smell disappears and the masala assumes a nice brown colour. Then, add the spice powders – turmeric, cumin and coriander. Stir well. Lower the gas to the minimum and tip in the yoghurt. Keep stirring till the yoghurt kind of disappears and gets thoroughly mixed with the masala. Now, add a cup of water, or the amount you want the consistency of your gravy to be, and let it come to a gentle boil. Slide in the fish pieces and the tomato slices, add salt and let it simmer for around 4-5 minutes. This will let the flavor of the lightly fried fish seep into the gravy and soften the tomato slices. Your fish kalia is done! You can garnish it with green chillies and coriander leaves and serve alongside some steamed rice. I believe Pujas and festivals are just another occasion for families to come together and enjoy their time with each other. Food happens to play the cohesive force. So, this Durga Puja, live life, laugh and eat to your heart’s content!